Skimping on sanitation is not an option, of course. Continuous improvement in food safety is as central to today's food processing as increased automation. Customers and the industry itself are less forgiving of carelessness in cleanliness. While all industry sectors must raise their game, the impact is particularly profound in baking, where the visibly clean standard is giving way to cleaning to a microbial level, as outlined in the Food Safety Modernization Act (FSMA). "The level of cleaning is going to change significantly under FSMA," believes Greg Flickinger, vice president-manufacturing and corporate engineering at Snyder's-Lance Inc., a Charlotte, N.C.-based snack foods manufacturer with a portfolio that includes cookies, crackers, pretzels and other baked goods. "The whole microbiology issue had not been on the table, but now we have more visibility to that side." Not being able to see protein or bacteria on a food contact surface no longer is a defense for not removing them, Flickinger points out. Early adopters of technology need to take a leap of faith, though in the case of Milne Fruit Products Inc., management had a pretty good idea where they'd land. Headquartered in Prosser, Wash., Milne supplies a range of fruits and vegetables in a variety of forms -- individually quick frozen, powdered, etc. -- to bakers and cereal manufacturers, among other food processors. In May, the firm extended its licensing agreement with Enwave Corp. to apply vacuum/microwave drying to strawberries, cherries, pomegranate and other fruits and vegetables. The technology produces whole, shelf-stable berries in a process similar to freeze drying but using significantly less energy. Enwave introduced its "radiant energy vacuum" dehydration technology four years ago, and Milne entered into testing and pilot-plant production agreements soon after. A line installed in the company's Nampa, Idaho, facility, is producing MicroDried fruits for all-natural granola bar makers such as Leclerc Group and Snack 180. "People want cleaner (ingredient) labels, and most dried fruit is infused with sugar and perhaps preservatives and artificial colors," says Shannon Elkins, Milne's director of sales and marketing. The technology gives Milne the ability to dial in moisture levels as low as 2 percent and as high as 12 percent, he adds, depending on the desired taste and texture. It also tends to puff up a berry after drying to approximately its starting point, giving it visual appeal. "This is cutting edge in terms of drying and gives us a unique platform in the ingredient market," Elkins believes. "It's revolutionary technology that gives us revolutionary results." 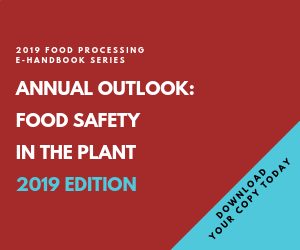 Many FSMA regulations aren't likely to be phased in before 2015, but he has spent the past two and a half years preparing Snyder's-Lance's 10 bakeries for the preventive approach to food safety that will be required. Evaluation of existing equipment is part of the initiative, and when new machinery is ordered, sanitary design is the top criterion. "Quite a partnership is evolving with the OEMs, who are designing equipment with angled surfaces and no unnecessary holes and harborage points," Flickinger says. Capital expenditure limits prohibit replacing "heritage equipment," so work teams are modifying the most problematic for accessible cleaning. Retrofitting comes at a cost, however: "We may have to spend more time cleaning," he allows. Reduced cleaning time usually is relegated to the soft savings column, though there is nothing soft in getting a line running 30 minutes faster. Increased capacity drove Canada Bread Atlantic in St. John's, Newfoundland, to replace gyratory box screeners with pressurized centrifugal sifters from Kason Corp. The 43 percent boost in throughput capacity wouldn't have been meaningful if cleaning requirements were extended, and that is where soft savings really added up. The new sifters require only 10 minutes to clean compared to 90 minutes with the old screeners, according to the plant's maintenance manager. The industry template for sanitary design was set 10 years ago when the American Meat Institute (AMI), with input from meat and poultry processors, design engineers and equipment manufacturers, unveiled its 10 principles of sanitary design. Those principles -- no liquid- or product-collection areas, no niches, validated cleaning and sanitizing protocols, cleanable to a microbiological level, etc. -- have been embraced by many industry participants, including OEMs catering to bakeries. In some cases, those vendors also serve meat and poultry processors, making sanitary design a given. An example is Vemag, the dough divider and makeup system from Robert Reiser and Co., Canton, Mass. The machine originally was engineered to pump sausage meat into casings. The heart of the system is a positive displacement pump that precisely meters materials between double screws. The AMI principles stipulate compatible materials of construction, and that is construed in meat to mean stainless steel food-contact points. Reiser fabricates its tandem screws from stainless, regardless of whether they move sausage or dough. The supplier took cleanability to an even higher level when it secured 3A certification for dairy applications, according to John McIsaac, Reiser's vice president-strategic business development. "Within three to four minutes, all the machine surfaces can be exposed for cleaning, and the process is mostly tool-less," he says. The same polished surfaces, configuration of O-ring grooves and other details of construction can be found in dough dividers. "High production bakeries really have been raising their game," McIsaac adds. "One of the critical control points in baking is the divider. Under pressure from key customers, they're taking swab tests, and a lot of the older equipment is not making the grade." Fresh Start Bakeries, a McDonald's bun supplier, installed a Vemag five years ago at its Ontario, Calif., plant. Additional installations have followed, though those purchase orders were driven not by sanitary considerations but by machine precision. Scaling accuracy is within 1 percent standard deviation. If a dough's target weight is 68g, the unit operates in the 67-69g range, McIsaac says. "We are not the cheapest machine, but we deliver value by not giving away product," says McIsaac. "With fluctuating commodity prices, that is our No. 1 selling point." While HMIs and PLCs are ubiquitous in commercial bakeries, the software that runs on them determines the level of process control each facility has. Ice cream becomes a handheld food when it's sandwiched between two wafers. Many of the ice cream sandwiches made in America rely on wafers supplied by Ellison Bakery, a family-owned operation in Fort Wayne, Ind., that also was the first licensee of Archway cookies (coincidentally, the brand now is owned by Snyder's-Lance). In terms of hygiene, "a bakery standard is not sufficient" when the customer is a USDA-inspected dairy, says plant manager Jon Ellis. "We put a lot of emphasis on execution of correct procedures and on minimizing the potential for foreign-material contamination." Just-in-time production and close monitoring of metal detectors and other control points also play to that effort. Ellison operates two bake lines in a 120,000-sq.-ft. facility that was expanded six years ago. Until then, production and packaging was done in an open-floor layout; with the added space, managers were able to isolate those operations. "Twenty years ago, it was acceptable to do everything in the same area, but not anymore," observes Ellis. Questioning accepted practices and migrating to higher standards is critical, particularly as the bakery seeks level 3 certification under the SQF food safety standard. As part of the effort, audits of vendors are conducted regularly to verify that their safety programs are consistent with the bakery's. A technician examines a dough sample produced by a single-lane divider at Robert Reiser and Co.'s pilot plant. Originally engineered for sausage production, the dough divider's sanitary design exceeds bakery standards, though the unit's precision is its primary appeal for bakers. Consistency of finished goods also is a priority, and the bakery is locked into a continuous improvement cycle with its batch controls architecture. A Win SPC program was installed a decade ago and has undergone three or four upgrades and expansions to recipe management, oven control and conveyor operating speed, Ellis reports. "Operators can make minor adjustments to forming, cutting, baking and cooling, but they can't go out of a preset range." A vision system tied to the program performs 10 quality measures, a major improvement over quality checks in which "you're hoping your calipers are straight across," he remarks. Sanitary design is a given with a greenfield project, suggests Brian King, president of AM King Construction Co., Charlotte, N.C., but "the conversation always begins with, 'What can we automate?'" When costs are attached to each possibility, the improvement list shrinks in proportion to the bakery's appetite for investment. King's firm was the contractor for Northeast Foods' Clayton, N.C., bakery, which came on line two years ago. Like Fresh Start, Northeast supplies McDonald's, which wants frozen buns delivered to distribution centers instead of fresh buns to stores. Conveyors suspended from roof trusses to facilitate cleaning and isolated areas for ingredient handling were designed with sanitation in mind, but high throughput and minimal operator involvement were the key objectives. King points to the "lights out freezer" as an example. Pallets of finished goods move in and out "with the push of a button," with inventory management software controlling an automatic storage and retrieval system that operates without human intervention. Another project distinction was the installation of three 1,000 KV diesel generators, which can power the plant completely off the grid. Back-up systems that deliver operating power are a growing trend, King suggests. Powerful storms like Hurricane Sandy and Oklahoma's recent mega-twister are stoking interest in self-generation. Utility companies are inclined to subsidize self-generation and provide more favorable rates to big-usage customers who can go off line during peak demand periods. Those arrangements can mean the difference between building a peak-shaving plant or not. Safety considerations should extend beyond the product to include the people who work in the plant, says King. Besides minimizing horizontal surfaces and overcoming the challenges of joining dissimilar materials such as steel and concrete without leaving crevices or fissures where vermin or rodents could enter, special attention was given to explosion-proofing in Clayton. Explosion panels surround the flour sifting area, which is further isolated from the production floor by a corridor. NEMA 4 enclosures and a separate air-handling system isolate controls panels, which were flagged as potential explosion points. Awareness of the combustibility of dust was high when the Clayton plant was on the drawing board. Only two years had passed since the Imperial Sugar mill in Savannah, Ga., exploded, killing 14 and badly injuring scores of other workers. Like sugar, flour particles can easily meet the sub-420 micron threshold for ignition in a confined space. While risk assessments of flour sifters and other vulnerable areas are ongoing at many bakeries, NFPA standards can leave plants vulnerable when transporting flour, maintains Nick Hayes, president of Volkmann Inc., Bristol, Pa. The standard excludes confined areas of less than 8 cubic feet. "That's not adequate," Hayes insists. "I don't want to be standing next to a 65-gal. drum when it explodes." The manufacturer of vacuum conveyors is the first supplier in its category to receive ATEX certification from TUV, the German equivalent of UL. Metal-to-metal contact can ignite fine powders, Hayes says, and European standards account for that potential, whereas U.S. standards do not. Besides explosion-proofing, all-stainless construction and a dense-phase vacuum system that results in less product degradation have helped elevate his firm to preferred supplier status with OEMs such as Reading Bakery Systems. High-yield baking is the focus of Auto-Bake, a Sydney, Australia-based fabricator of ovens and ancillary equipment that works closely with Dunbar Systems in suburban Chicago to deliver integrated production systems. Yield plunges when changeovers and washdown occurs, notes CEO Amanda Hicks, "and one of the fundamentals of design is the ability to keep a system clean while running virtually on a 24/7 cycle." Serpentine ovens that shrink a linear oven's footprint to almost a third are Auto-Bake's hallmark. The firm also fabricates modules for automatic depanning, pan washing and other functions. Another innovation is an infeed design that allows bakers to remove depositors and other ancillary equipment for cleaning without stopping the line by swapping in duplicate components. Engineers also have eliminated many of the transfer points typically found in integrated lines. "That's where things go wrong and you have product damage and downtime," says Hicks. Automated production would come to an abrupt halt if automated product transfer did not occur, a reality that elevates the humble conveyor to the status of critical component. A concerted effort has been made to improve the sanitary design of belts and frames to eliminate harborage areas and optimize cleanability. For example, Ashworth Bros. Inc. eliminated a bridge weld with open areas around the weld and rod end because of the potential for food debris to become trapped, replacing it with the Omni Pro zero-tension buttonless weld. The firm also created a metal/plastic hybrid belt for spiral freezers that convey sticky products that are difficult to release from a wire mesh surface. "The majority of our belts are used in both meat and baking applications," according to Kenneth King, commercial support manager at Winchester, Va.-based Ashworth. Dorner Manufacturing Corp. had the same processing segments in mind when it introduced a stainless steel, tool-less belt slacker unit called AquaPruf. The Hartland, Wis., supplier upped the ante seven years ago with a high-pressure washdown version designed to meet the AMI sanitary principles. The system generated good adoption in meat and poultry, but indifference in baking applications led to a simplified, more economical version. "We are selling some sanitary conveyors (to bakeries), but it is typically to higher end customers and only for a specific application," says marketing director John Kuhnz. "FSMA has not impacted the bakery industry as of yet." That view wins grudging agreement from Reiser's McIsaac. As a member of the American Society of Baking's committee charged with upgrading the voluntary BISQ standard, McIsaac discerns tension between what customers are demanding and where mainstream bakers are in terms of sanitary expectations. "I'm not convinced (sanitary design's) a priority in the bakery world," he confides, "but the ones who make it a priority are our target customers." If it isn't a mainstream priority yet, it will be, predicts Jill Batka, president of Dynamic Conveyor Corp., Muskegon, Mich. The fabricator of V style conveyors branched into the baking world a few year ago with an easy-disassembly version of its conventional conveyor. The units use solid, extruded thermoplastic belting that doesn't slip or fray, a problem of growing concern. (Ellison's is contemplating replacement of cloth-belted conveyors with vibratory units because frayed belts pose foreign-material contamination issues.) In a factory field comparison with interlocking belts, the solid thermoplastic belt reduced cleaning cycles to 13.5 minutes vs. 21.6 minutes and water use to 105.9 gallons vs. 190.7 gallons, the belt's designer reported. While high-pressure washdown rarely is applied in baking operations, minimizing cleaning time is a benefit every baker can appreciate. With allergen removal an area of growing concern and food safety expectations ratcheting up, it's only a matter of time before the mainstream joins the leaders in boosting production by improving hygienic design.